Just months after voters approved a state ballot initiative to revive Montana’s medical marijuana industry, patients are returning to the program by the thousands – breathing new life into dispensaries across the state. Dispensaries were effectively regulated out of business last August when a 2011 Montana Supreme Court decision limiting MMJ dispensaries to three patients finally went into effect, making it impossible for the businesses to remain viable. But a ballot initiative passed by voters in the November 2016 election removed the three-patient limit, and a subsequent judicial ruling in December allowed dispensaries to reopen immediately. 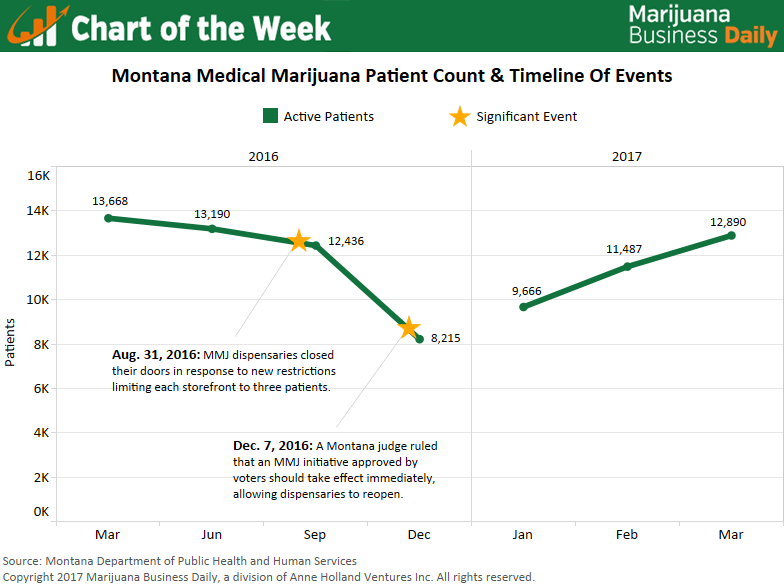 Since that decree, MMJ patient counts have increased every month. As of the end of March, the number of registered patients was up 57% since bottoming out in December. An average of 1,500 new or returning patients have enrolled in the program each month in 2017, and growth will likely continue for the foreseeable future. Patients have been able to return to the program quickly because many dispensaries didn’t completely halt MMJ cultivation. Instead, dispensaries continued to operate in a very limited capacity as patient caregivers to remain compliant with the three-patient limit. Doing so enabled those businesses to scale up instead of starting over. Montana voters first legalized MMJ through a ballot initiative in 2004. While the law didn’t establish a statewide dispensary program, some local municipalities do regulate these businesses. Both nonprofit and for-profit dispensaries have existed in the state for years. The program reached its height – boasting more than 30,000 patients – in June 2011, just before the state Supreme Court’s critical decision. It remains to be seen if patient counts will return to those levels. State lawmakers are currently working out the details of new rules to regulate MMJ businesses. A statewide regulatory system is expected by some time next year – if not before. Montana’s MMJ business climate will ultimately depend on how lawmakers choose to regulate the industry, but annual sales via dispensaries could hit $25 million-$35 million within a few years, according to initial estimates by Marijuana Business Daily.